Dr. Baumler attended the University of Illinois after doing graduate work at ASU. 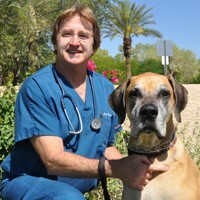 He graduated in 1981 and returned to practice at Central Phoenix Animal Hospital. 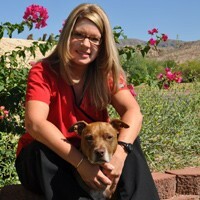 Having lived in Ahwatukee since 1986, Dr. Baumler decided to open Foothills Animal Hospital in 1989. Dr. Baumler enjoys all aspects of veterinary practice but prefers surgery including routine spays and neuters as well as the challenge of more difficult orthopedic procedures. Dr. Baumler is married to Dr. Vicki Baumler, a local equine practitioner, and their family consists of two horses, a Great Dane and a German Shepherd. Dr. Baumler enjoys sports, hiking, riding and traveling with Vicki. Dr. MacKenzie was born and raised on the East Coast of Canada. He wanted to be a veterinarian at a very early age and was excited to get accepted into the Atlantic Veterinary College. 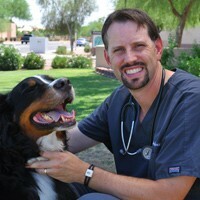 After graduating in 1999 he quickly relocated to Arizona and was happy to find Foothills Animal Hospital. 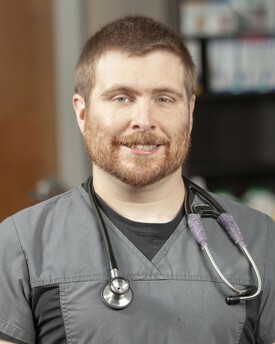 After working as an associate veterinarian for seven years he became part owner in January of 2006. His medical interests include radiology/ultrasonography, soft tissue surgery, and internal medicine as well as being trained in the use of acupuncture on animals. Outside of the clinic, Dr. MacKenzie enjoys family time with his two daughters Ella and Lexa. When time allows he enjoys playing sports as well as various card games. Currently his family also includes four dogs, Zeus and Xena, Bernese Mountain Dogs; Scamp, a Maltese/Yorkie Mix; and Thumbelina, a Shih-Tzu mix. Also, his daughters have talked him into a chameleon and some fish, as they share his love of animals. Dr. Iverson is native to Arizona. She grew up in Tempe and attended Northern Arizona University in Flagstaff where she studied Zoology. She began her journey at Foothills Animal Hospital as a receptionist initially and then became a veterinary technician in 2002. In 2008, she obtained her degree in Veterinary Medicine at Colorado State University in Fort Collins and moved back to the Phoenix area to be close to her family and friends. Dr. Iverson was thrilled to be invited back to Foothills Animal Hospital to practice veterinary medicine. She enjoys everything about her job but is especially interested in dermatology and internal medicine. In her spare time, she enjoys hanging out with her energetic pit bulls, Rex and D.C., and her three cats, Maynard, Geddy Lee & Thurston Moore. 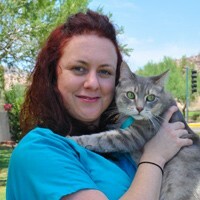 Dr. Johnson, a Nebraska native, joined the Foothills Animal Hospital team in June 2010, having completed her Doctor of Veterinary Medicine at Ross University School of Veterinary Medicine in 2005. She has a special soft spot in her heart for all breeds "Bully". Dr. Johnson’s special interests include anesthesia and pain management, internal medicine and dermatology, and she works hard to nurture the all-important human-animal bond through both client education and advanced medicine. While Dr. Johnson has been quoted as saying she has "the best job in the world," she does enjoy an occasional lazy football Saturday with the Huskers, snow skiing, antique shopping and a Kenny Chesney concert or two when time permits. Currently Dr. Johnson and her husband share their home with the beloved three legged Pit bull, Roo, the stubborn yet lovable Shiba Inu, Bodie, and their two cats, Herbie Husker and Sid Vicious. Dr. Marc grew up on a small hobby farm in St. Andrews New Brunswick on the east coast of Canada. After receiving his biochemistry degree from the University of New Brunswick he attended the Atlantic Veterinary College on Prince Edwards Island and graduated in 2013. Next he moved to Salt Lake City Utah where he worked for 4 years as a small animal veterinarian. In 2017 Dr. Marc, his wife, and their german shepherd moved to Ahwatukee to be closer to family and Dr. Marc started working at Foothills animal hospital. Dr. Marc's special interests include veterinary dentistry, radiology & internal medicine. In his spare time he enjoys hiking, curling, playing board games with his wife and friends, and hanging out watching television with his cat Poppet.